Suitable for DSS, C/Ku satellite installations. High-performance 100% fully swept to 3GHz. Great for connecting to your VCR, television or any other video device requiring screw on gold F type connectors. Our RG6 Coaxial cables are environment friendly and available in different sizes & types too. You can buy the right coaxial cable based on instrument type and cost. Our coaxial cables collection includes high bandwidth coaxial cable, coaxial cable gold plated and many more. F-Type RG6 Coaxial Cables are mostly used to connect VCR, Security systems, Cable/Satellite boxes and antennas. 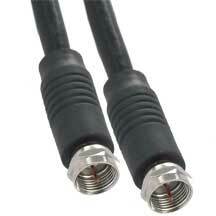 The cables and other components used for RG6 Coax cables are of high quality. Moreover. We offer 60 days money back guarantee on our cable products. We also provide extended warranty and lifetime technical support to ensure you are never left out in the cold, if ever you face a problem with our cables.